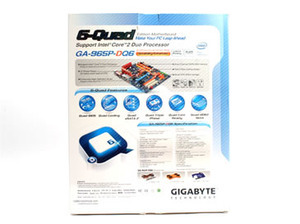 Gigabyte is a well known Tier 1 motherboard manufacturer that has consistently produced solid boards for many years. With this kind of reputation, we're always happy to get some time with the company's offerings. Today, we take a look at its top of the range P965 model: the GA-965P-DQ6. This board is based on Gigabyte's new "quad" ethos and has lots of pretty much everything that performance seekers, enthusiasts and overclockers could ever want - it also claims to be a diamond overclocker with the latest F5 BIOS. This is something that we're not used to seeing on Gigabyte boards, as they have typically lacked enough features and tweak options to truly cater to the enthusiast. With all of this in mind, we have given the GA-965P-DQ6 a thorough grilling over the last couple of weeks - read on to find out if it came out smokin'. Ten USB 2.0 ports, six internal and four on the rear I/O. Wow...Gigabyte has come so far, but left out a few essentials from the bundle. The provision of eSATA is just unheard of elsewhere, and is definitely a good thing for external storage. Having said that, though, if you don't have a case to put your hard disks in, you leave them prone to static attack or being dropped in daily life. This is a pretty big worry. The big downside is that you don't get enough bits to use every port in every way. 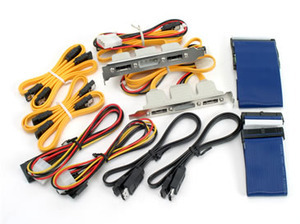 For example, if you're just using the SATA ports for internal disks, then you'll need to stump up an extra four cables in order to use all the ports on the board. Or, if you wanted to use another two eSATA disks, you'll have to find yourself another PCI bracket (which is a much tougher task). There are also no USB 2.0 or Firewire PCI brackets included. This is a shame, because they are arguably more useful than the eSATA expansion brackets that Gigabyte has bundled with the board. 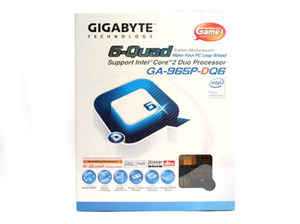 I mean, virtually everyone has multiple USB devices; and, at the same time, there very few that need eSATA connectivity to the extent that Gigabyte has gone to here. In fact, I would go so far as to say that many just choose to use a USB 2.0 hard drive enclosure for backup purposes. 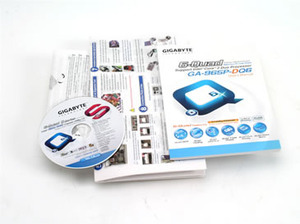 As usual, Gigabyte includes a decent manual with lots of pictures and some brief explanations, along with a very useful quick reference hardware installation guide for those of short attention span or time. In summary, it's not a bad bundle and it comes with some unique additions, but these come at the expense of other, arguably more useful inclusions.